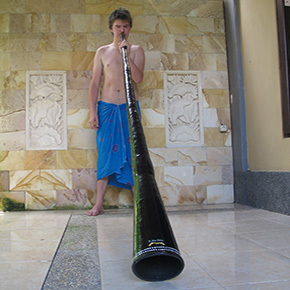 The Travel Doo is like 12 didgeridoos in one pack you can carry around with you! 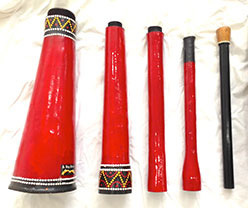 Plays from Low C to high C.
The TravelDoo comes in 5 pieces; three main body parts, a large ‘bell’ section and the slider pipe with wooden mouthpiece. All packed into a 60cm bag weighing 2.5kg – including the bag. It is lightweight and portable (2.5kg – including bag) travel friendly and suitable for most playing situations. Strong and durable. It’s sound is full, resonant and has great back pressure making it easy to play toots in all keys. The sliding components have been made to slide then hold position so if you want a more ‘active’ slide effect then you will need to rub some vaseline in the slider pipes.